GHANA HAS begun the use of drone technologies in farming as it takes steps to digitize and revolutionize its agricultural sector. The Amdrone Tech drones are being used in precision farm spraying and in crop diagnostics respectively. Currently, according to Managing Director of Qualitrace, Kenneth Nelson, the drones are being designed in Germany. He noted that there are plans to set up assembling plant in Ghana for the drones. Managing Director of Ziongate Geospatial & Research Services Limited, Bernard Essel, told DGN Online that the drones have so far been used in the Central and Ashanti Regions for mapping of maize farms, noting that they had 99 percent accuracy. He says enticing the youths into agriculture going forward would require digitizing the sector immensely. 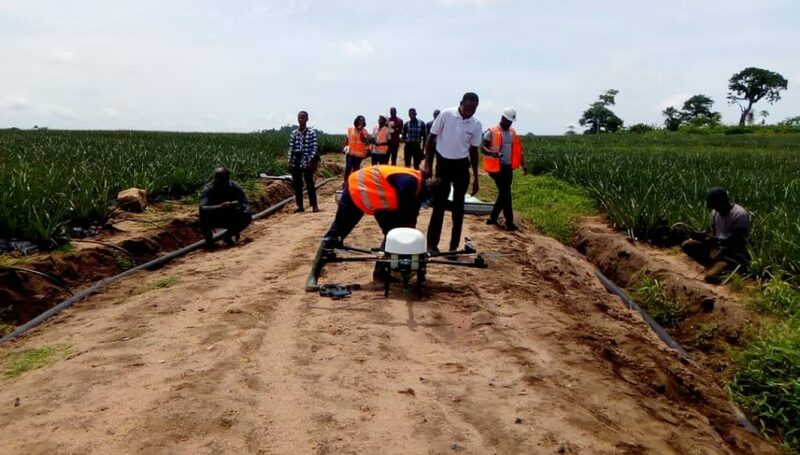 Head of Communications Technical Centre for Agricultural and Rural Cooperation, Tobu Johnson, told journalist during field trips to Bomarts Farm at Ga South Municipality, Greater Region, and the Kosmos Innovation Centre Fields, Kasoa, Central Region, on Monday that the application of the drones would led to an increase in income and productivity of farmers. About 20 Ghanaian and international journalists were taken on the trips which form part of activities heralding the Alliance for Green Revolution Forum 2019. The Amdrone Tech drones come in 15 and 25 litres and have the capacity of spraying two hectares in 30 minutes and 100 acres in a day. They carry out aerial spraying of pesticides, crop pest and plant nutrition management, agro input services, among others. The Government of Ghana through the Ministry of Food and Agriculture is considering the adoption of the technologies. Already, as part of efforts to promote green revolution in Ghana, the Ministry has been working assiduously to train university students in coding and greenhouse technologies. Ghana is expected to host in September this year’s Alliance for Green Revolution Forum. The forum, expected to be launched on Tuesday, April 16, is to take place in Accra and would focus on how agriculture on the African continent could be digitize to ‘entice’ young people in farming. About 65 percent of Africa’s farmer population are of age and the introduction of digital technologies is increasingly being viewed as a perfect way to ‘hook on’ the youths majority of whom are below the age of 35 into the agriculture sector. Head of Communications at AGRA, Waiganjo Njoroo explained that digitization “is the way to go” in revolutionizing agriculture in Africa.